A Samsun couple, both judges who were earlier removed from their offices over alleged ties to the Gulen movement, were sentenced to 6 years and 3 months in prison. O.F.K. and his wife F.K. 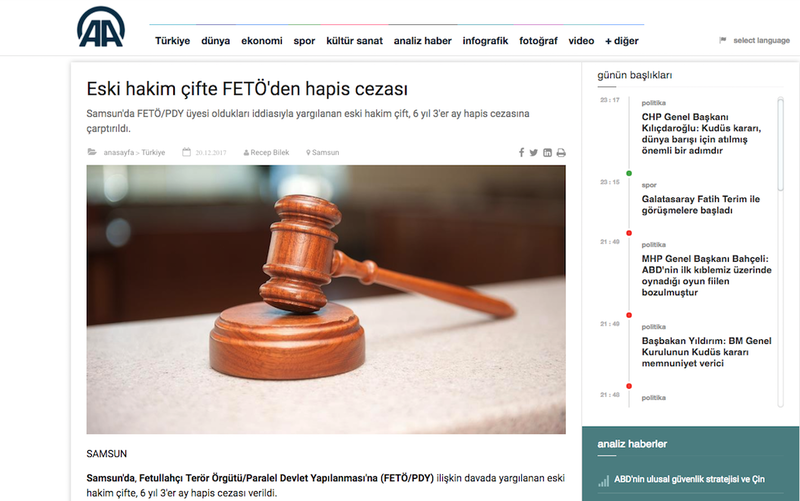 appeared in their final hearing, state-run Anadolu news agency reported on Dec 20. The couple pleaded not guilty to the charges of membership to the Gulen movement, which the government calls a terror group. Anadolu said O.F.K. has been released on judicial control as he spent some one year in pretrial detention. Turkish government accuses the Gulen group of masterminding the July 15, 2016 coup attempt while the latter denies involvement.